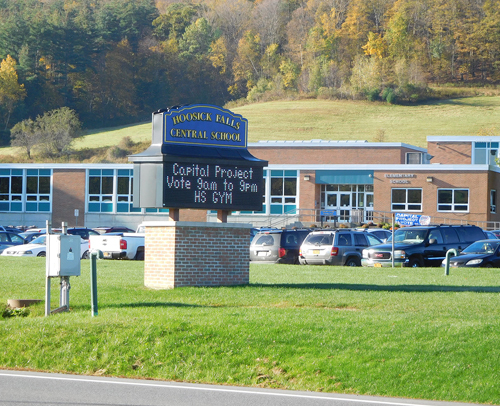 The Hoosick Falls Central School Capital Project proposed for $19,755,973 failed to win the approval of the voters at a special vote held Tuesday October 17. The vote was 418 yes and 456 no. The School Board seemed to be devastated by this result. They reconvened and formally accepted the defeat of the proposition. School Superintendent Ken Facin repeatedly said to himself, “ouch” right after the vote was announced. John Helft, who has led the committee which developed the project, said he did not want to comment. Board President Greg Laurin said he didn’t know what to say. Facin rallied after the vote had been accepted by the Board, and said, “It’s really disappointing for the students and for the School District to hear this result, but the voters have spoken and it’s a democratic process. This is the second defeat for a Capital Project for this District. We don’t know what the future will bring for this District in terms of the physical plant, but we thank the voters for voting.” He indicated the Board and the administration will have to reconsider its options and decide what to do next. This dark mood among the Board and the administration is not surprising. Laurin and Helft and the rest of the Board have put in countless unpaid hours developing the project and presenting it to the public in the three years since the last one went down to defeat, and felt they had put together a winning package that would get the building in top condition without giving themselves budget headaches. For the administrators, they come to work tomorrow facing the same building deficiencies documented in the last 5 Year Building Survey, but with great uncertainty about where the resources will be found to address them. The turnout was pretty good. 874 votes cast is a pretty high number for a Hoosick Falls School District election. The Board held quite a few information sessions in the month or two prior to the vote, which were very lightly attended. This is a very disappointing outcome for both the town and the school. The students of Hoosick Falls deserve better. Our school is one of the key assets in town and letting in languish is not productive. Funding for this project was very attractive, almost $20M for the cost of $2M. I would always take that deal.